IOWA CITY – Brandon Snyder’s season hung in the balance in April. A torn left ACL meant that he would likely be out for his entire junior season, a season in which he was expected to emerge as one of the leaders of the Hawkeye secondary. Setting his sights towards a full recovery, Snyder refused to acknowledge his entire season would be gone. He would miss time, there was no doubt about it. But he would be back. He knew he’d be back. Snyder and Doyle, Iowa’s strength and condition coach, went to work with that in mind. Getting back on the field as quickly as possible is dangerous, as it leaves the door open for a re-injury. Together, the two managed to get Snyder back to the field just five and a half months after surgery, a remarkably quick recovery for an ACL injury. More importantly, it was successful. In Iowa’s fifth game of the season, Snyder was cleared to dress in full uniform and participate in warm ups. 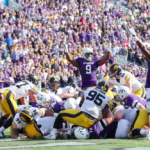 A week later, on Homecoming Saturday in Iowa City, he was fully cleared. Starting at free safety, Snyder’s impact was felt right away. 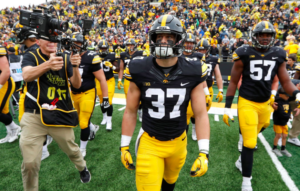 The Iowa defense raved all week about how he manages to make the team better, even when he was sidelined with the injury. In the third quarter, Iowa was clinging to a 17-13 lead. The offense had stalled twice in a row, and the defense needed to make a play to wake the team up. Illinois quarterback Jeff George, Jr. dropped back to pass and overthrew his intended receiver. The ball hit Snyder right between the “3” and “7” on his jersey as he brought it in for an interception. 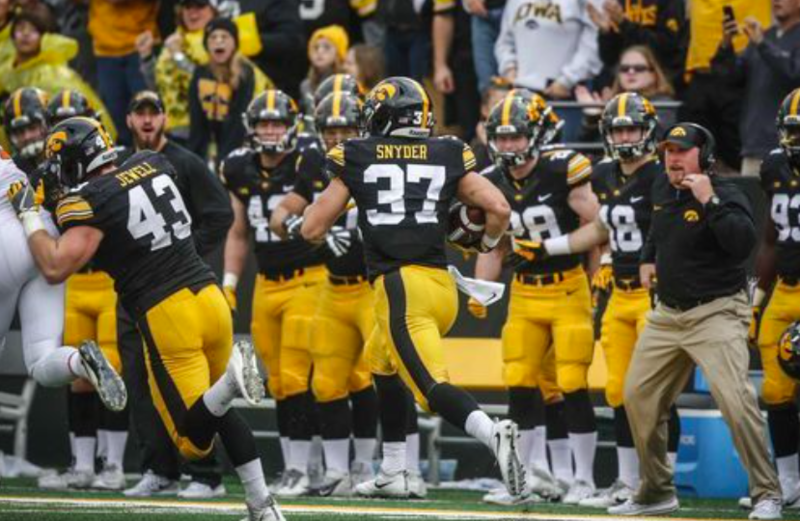 Taking off the other way, Snyder had 89-yards to reach the south end zone of Kinnick Stadium. Senior linebackers Josey Jewell and Bo Bower were in front of him, ready to lay blocks and get Snyder free. Behind him was a grueling, but speedy and efficient recovery. Behind him were the emotional struggles he felt when he couldn’t be on the field to help his team. Behind him were teammates, coaches, trainers, and his faith, who all had helped him make this moment possible, a moment he had been imagining since April. For the final 20 yards, he reflected on the past five and a half months. It hadn’t been easy. He needed a lot of help to do it. But he did it, and he earned the moment. “I was just trying to take in the moment… and just how cool it is to be back in Kinnick Stadium and be healthy,” Snyder said. One couldn’t help but watch in awe as a former walk on, less than six months removed from an ACL tear, made a play to catapult his team to victory. 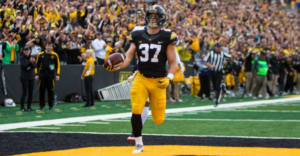 His play had changed the tides, and ignited the Hawkeyes to a 45-16 blowout. Not many people outside Snyder’s circle believed this kind of comeback was possible. Family members and teammates weren’t so surprised. Many of them, even during the play, couldn’t help but stop to recognize the magnitude of what Snyder had done. A person can learn a lot when they face adversity head on. Snyder gained an appreciation for what he has, who he has around him, and what his faith has blessed him with. Moments like this should be savored for as long as possible. He savored the final 20 yards, and surely will for a long time after.